I like to do this on days when I won’t be at the house and it’s my day to fix dinner (the kids take turns). Now, I don’t know what size your slow cooker is, so we’re going to do this in layers. I’m going to give you approximate amounts that I use in my 8 quart pot, but basically you’ll be layering in the veggies to begin with. Aren’t those colors gorgeous! Depending on the size of your slow cooker you may use more or less of the ingredients above. You’ll basically layer the ingredients, making sure you have a full layer of each before adding the liquid. 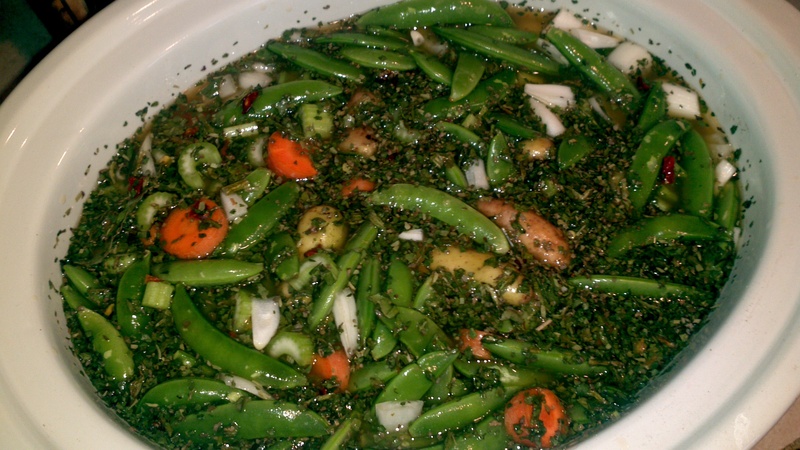 Add vegetable broth and water till veggies are more than covered (1-2 inches above). I like the potatoes to be nice and soft so I cook it on “high” for at least 5 hours (adding water if needed). We eat this over a bed of rice. The 10 year old, grain-free, kid has it over grated jicama instead of rice. Sometimes I saute the jicama in a bit of vegetable broth, and sometimes she eats it raw. If I forget to prepare the rice in time (yes, it happens) they just dish it up into a bowl like stew. Add a large salad and enjoy! Obviously, this being a veggie dish, you can add whatever vegetables you have on hand. squash would be lovely. 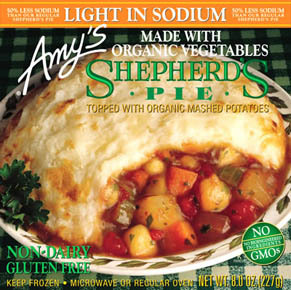 If something happens, like you turn on the slow cooker but don’t notice that it’s not plugged in until time for dinner (yes, I’ve done this), you can run to your local grocer or health food store and pick up Amy’s Light in Sodium – Shepherds Pie – my kids love it! The grain-free kid has it sometimes when the others order pizza too. Be sure to add that salad you prepared for the Stewp. My next recipe will be vegan potato soup, which I made for the first time yesterday. It was met with rave reviews from the cooked vegans in this house. This entry was posted in Food, Tools and tagged vegan recipes by Jules Lane. Bookmark the permalink.